The long awaited patch for the PC version of Terraria will be out on October 1. 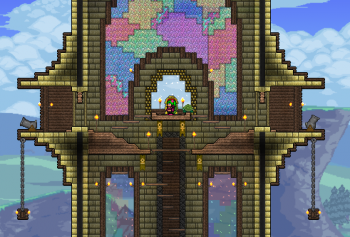 It's been a long and bumpy road for Terraria's dedicated PC fanbase. First there was all that business with developer Re-logic claiming development on the title was finished, and then announcing a console version with a bunch of exclusive content. Then, back in May, Re-logic promised a massive 1.2 update with a substantial amount of new content for the game's PC version, with a tentative release date of "July". So, PC gamers waited, and waited, and after July came and went, some wondered if the update would ever see the light of day. But, just as everyone was losing hope, Anthony Spinks announced over Twitter the news that everyone has been waiting for: The 1.2 patch will be released on October 1. Hooray! The update includes over 700 new additions to the game, including 500 new items, three new bosses, a new ice and forest biome, mounts, and much more. You can check out the full changelog of new additions here. Re-logic claims that this is the biggest update the game has ever received, being several times larger than the 1.1 update that introduced "Hardmode" to the game. Overall, it's an absolutely beastly amount of new content. Re-logic says that they are completely finished adding new features, and are just cleaning up bugs ahead of the October release date. Furthermore, if you do happen to own Terraria on console, don't feel too shunned, as the official developer for the game's console versions want to bring the 1.2 update to the PSN and XBLA versions of the game.